This is the setting for Iron Dynasty: Way of the Ronin, an RPG published by Reality Blurs, Inc. Employing the Savage Worlds rules published by Pinnacle Entertainment Group, it promises “Oriental Action! Savage Style” and ‘heavy metal chanbara’, something that the slightly cinematic mechanics of Savage Worlds can deliver. It combines Japanese style fantasy with its myth as well as a fantasy take upon a classic element of Japanese anime – mecha. It offers numerable character options – Artisan, Ashigaru, Bandit, Bodyguard, Entertainer, Kensei, Ninja, Noble, Priest, Ronin, Scholar, and Yakuza will be familiar to most gamers. New to Iron Dynasty are the ganso, masters of machinery; kikai driver, war walker pilot; makoto, chosen by the kami; onmyoji, capable drawing and commanding the energies from the around them; and yamabushi, mountain warriors who have come down from remote temples. Character creation is a simple process, adhering to the given rules for Savage Worlds. A player purchases dice levels to assign to his character’s Attributes and Skills, selects his Defining Interests and Languages as well as Edges (advantages). If he wants more Attributes, Skills, or Edges, he selects Hindrances (disadvantages). All characters are human, so all characters receive a free Edge. The process is easy, but this being a Savage Worlds setting, the best way to create a character is to select a character type and any associated Edges and work backwards to ensure that the character qualifies. (It should be pointed out that this is common of many RPGs, but is particularly so of Savage Worlds because the Edges define a character so). So for example, the Geisha requires a character to be female and have Smarts d6 and Persuade d6, whereas Close Fighting requires Novice, Agility d8, and Fighting d8. Our first sample character is closest to what most people would think fits the Chanbara genre. She is a Ronin, an honourless swordswoman forced to take up her father’s katana after he is killed in a border skirmish that became an invasion from a rival region. Rather than be captured by the invaders, Tsutaro fled and has been wandering the land ever since. In supporting both roles traditional to the chanbara genre and newly presented to this setting, Iron Dynasty introduces innumerable Edges as well as a few Hindrances. Many of these are combat related, for example, ‘Arrow Cutting’ enables a character to block missile weapons, ‘Empty Hands’ makes a character’s unarmed attacks deadlier, whilst ‘Shadow Arts’ grants a bonus to tricks when using the interplay between light and dark. The latter of course is perfect for ninja characters. Others also support the traditional elements necessary to a Japan-like RPG setting, such as ‘Geisha’, ‘Disgraced/Dishonourable’, and ‘Cultured’. Many of the new Edges support aspects particular to the setting, including Arcane Background (Ganso), which enables a Ganso to craft wondrous devices capable of simulating the effects of Powers such as armour, bolt, fly, healing, and stun. In addition to selecting more Powers to emulate, a Ganso could select other Edges and take Craft Device to grant a bonus to one of his Attributes or Gadget to simulate another Edge. For example, the Ambidextrous Edge could be simulated with a Gadget called ‘A Two-Handed Approach’, the character being free to name the device as he wishes. Plus a character can lend his devices to the other player characters. Both Arcane Background (Makoto) and Arcane Background (Onmyojio) are supported in similar fashion with further Edges that enhance their effects. Where those effects are primarily external, those for Ki Control are internal as the character exerts control over his own life energy. These include armour, boost trait, deflection amongst others, and again, there are further Edges that enhance the core Edge. Unlike Edges like Arcane Background (Ganso), Arcane Background (Makoto), and Arcane Background (Onmyojio), the Ki Control Edge is not an Arcane Background and cannot be combined with an Arcane Background. That said, the Sensei (or GM) can allow a character to select the Ki Control Edge after character creation as a result of play. Combining the Ki Control Edge with other Edges, for example, with ‘Shadow Arts’ to make an interesting Ninja or ‘Signature Moves (Katana)’ to create a Wuxia style samurai. Our sample Ganso is a peasant miner who discovered his ability to work with machines after helping the mine’s engineer. He dreams of building his own kikai, but so far he has only managed to build a rope launching device that allows him to climb up and down and because the rope can be stiffened, to launch himself into the air. The rope can also be launched to entangle others. For the most the rules and character generation in Iron Dynasty are well done. One issue is that character generation does not tie characters into the setting as well as it should. Each player is expected to select a home province for his character. It would have been nice if there had been small mechanical benefit to help a player make this selection. One obvious omission from amongst the numerous Edges and options is that of Legendary Edges. What this means is that progression for the characters is limited and they cannot be truly heroic within the setting, at least not mechanically. Another issue is that it is all too easy to be overwhelmed by these options, but the rulebook handily suggests the roles that a party in Iron Dynasty should fulfil – Healer, Infiltrator, Talker, Thinker, and Warrior. For the Sensei, Iron Dynasty gives a more detailed examination of Konoyo and its nine provinces. This includes places of interest and whispers and rumours. There is also a guide to creating monsters and the corrupted – men who have been tainted by mad kami or the land itself. This is in addition to the bestiary, but idea here is that the true threats and enemies faced by the player characters should be truly unique. Along with the very useful set of Plot Generation tables, the Sensei is given not just one, but seven Campaign Frameworks that in turn deal with different aspects of the setting. 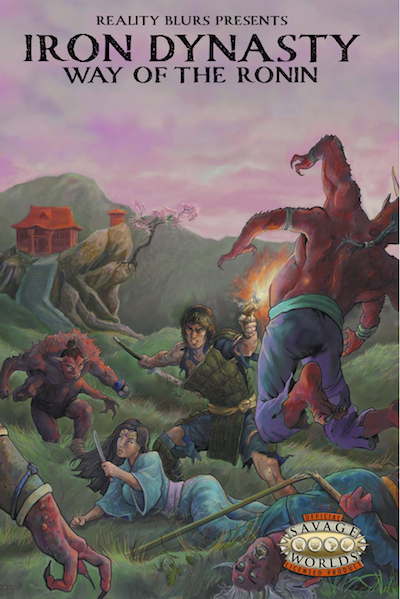 Just because the author can, the first of these is a ‘Heroes of the People’ style campaign entitled ‘The Seven, Oh, Y'Know…’, in which our heroes help defend a village against ever more dangerous foes… Rounding out the book is a description of three of the setting’s legendary Kakai and descriptions of various mystical artefacts. Physically, Iron Dynasty: Way of the Ronin is well presented and nicely illustrated. The setting of Konoyo feels underwritten though and it does not help that the book itself could have been better organised. The issue is that the author does not pitch the book and the setting as clearly and successfully as he could have done. It needed to be more up front about what the book and the setting is about. Nevertheless, once the reader gets into the book the setting, at least in terms of character options and the adventuring possibilities as presented in the Campaign Frameworks, more than make up for the lack of a pitch upfront. The elements that Iron Dynasty introduces to feudal Japan may prove to be unpalatable to the purist, the player or GM that does not want their Far East to be quite as fantastical as that presented in Iron Dynasty: Way of the Ronin. Nevertheless, what the rules do is provide for some great character concepts and the means to play them as well as foes and stories that the Sensei can present to the players and their characters. The result is that Iron Dynasty: Way of the Ronin is a very playable fantastical version of chanbara Japan.